Alterations to the flood plain in the vicinity of Hamilton Garage, Sidford, Sidmouth, February 2006. Please allow time for photos to load (3 minutes on slow modem). If some do not load, click 'refresh' and the rest should come through. Objections were sent to EDDC and the Environment Agency early in March 2006.
surface water run-off can be much faster from built up areas than from heavily vegetated land, leading to an increased risk of flooding downstream. 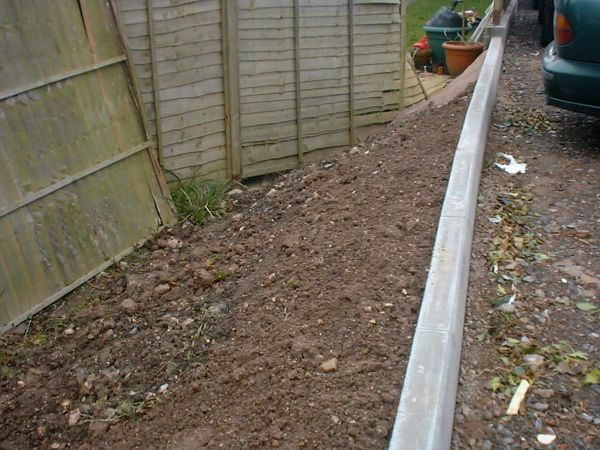 Alterations to Hamilton Garage, Sidford contravene both of these basic principles of flood plain protection and were initially thought by the Environment Agency to have been undertaken without proper consents. 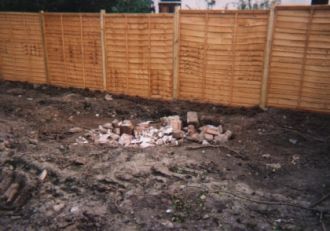 In February 2006, much of the original garden of the property known as Village End was increased in height by about a metre - increasing the risk of flooding for neighbouring properties. There may also be an increased risk of flooding on the main A3052 road because storage capacity has effectively been removed from the flood plain at a critical point just upstream of the Sidford Bridge. Also, one of the 'escape routes' for flood water that cannot get under the bridge has been substantially narrowed. This may increase the risk that the river overtops its banks further to the north, and may increase the flood risk to properties in Hamilton Close, for example. Large scale dumping of building waste or other material on the flood plain of the river Sid near the neighbouring village of Sidbury occurred several years ago - and planning applications were made to build on the land once it was "not prone to flooding" - true enough once its height had (illegally?) been increased! A large flat car parking area has now been created for use by Hamilton Garage (see photos below). Hundreds of tons of either building waste or earth must have been imported. Should extensive landfilling on this area of flood plain have been approved? Was direct discharge of surface water into the river permitted and if so why? If not, what is going to be done about it? As of mid March 2006, the EA were 'investigating' and a stop has been placed on further work. The EA enforcement officer was sufficently concerned to issue a Code B notice under the Police and Criminal Evidence Act - see this transcript. 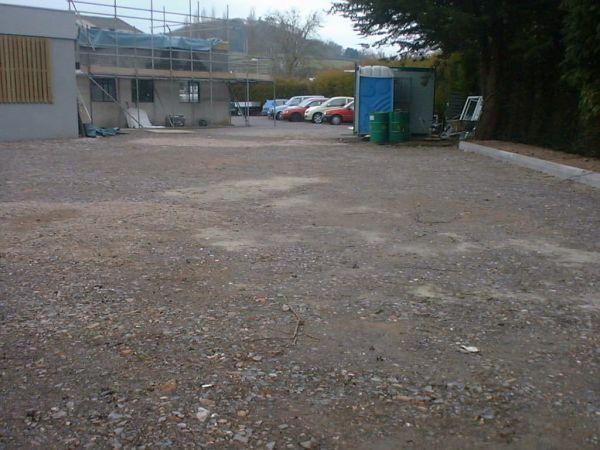 In view of the chequered planning history of the site and the known previous behaviour of its new owner (Mr Hooper), three bodies should have paid more attention to what he was doing: Sidmouth Town Council, East Devon District Council (EDDC) and the Environment Agency. All three appear completely to have failed to comprehend what was proposed - with the result that planning consent was given by EDDC and despite that the scheme had been passed to the EA 'for comment' - the usual procedure. The formal EA response was a meek suggestion for a 5 metre wide strip of planting to encourage wildlife but - seemingly - no-one either asked for specific permission to dump hundreds of tons of material on the flood plain or foresaw that such a thing might be inherent in the sketchy plans that were submitted. Interestingly, the whole car park was (conveniently?) missed off one of the original planning applications - a point picked up by EDDC. Despite that formal planning consent was given the fact remains that the applicant should have been advised (and especially by his own planning consultants) of the special requirements in flood plain areas. The fact that raising of the ground levels was (apparently) never mentioned in any of the planning documents is suggestive of either incompetence or a deliberate omission. A year or so earlier, Mr Hooper's reported 'defence' in respect of cutting down a large protected tree on the site (one that was in the way of his proposed building extensions) was that he "didn't know what all the fuss was about". Presumably, as a long-term owner of a half dozen houses in Sidford's conservation area he didn't know about conservation area planning constraints. The EDDC planning officer has admitted to me that when he inspected the proposed car park site he 'assumed that the applicant was going to raise the level of the land' but apparently he didn't see fit specifically to warn the EA of this potential violation of flood plain principles. When it was at its original and natural low level, this area of land was amongst the first to flood in severe conditions. It provided some defence against a sudden onrush of water onto the main A3052 road at its lowest point in Sidford. These photographs of the land-filled area were taken in late February 2006. Leaving aside the apparent incompetence within every organisation that is supposed to work 'in the public interest' in deciding or commenting upon planning applications in flood plains and other sensitive areas, there seem to be three possibilities here - either the site owner was badly advised, or his planning advisors knew exactly how much they could 'bend the rules' and get away with it in the East Devon (EDDC) area, or, maybe, that the work was done in a cavalier fashion and without seeking any advice at all. Mr Hooper certainly knew of his responsibilities as a riparian owner because he had earlier obtained consent from the EA for some work on the river wall (revetment). In that application there was no mention of raising of the ground levels - and no such consent by or on behalf of the EA was given or implied. The new car park looking south. This land used to be about a metre lower - level with or even lower than the remaining garden area of Village End. In the floods of 1968, the brick wall between Village End and the main A3052 was apparently knocked down into the road by the force of water. Looking east towards the river, the fence that used to divide an almost level area of garden is now well below the height of the new car park. The large boulders used to build up the river wall can just be seen in the background. The drain for surface water is in the top left of the photo. Two earlier photographs, dating from when the fence was first erected, are shown here for ease of comparison. 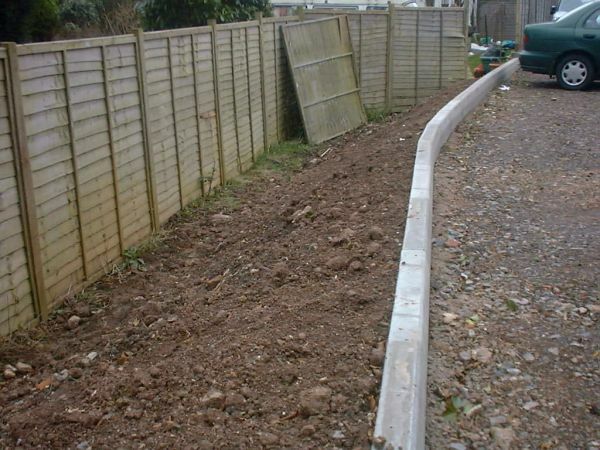 The newly installed fence was broadly 'at ground level' on both sides. 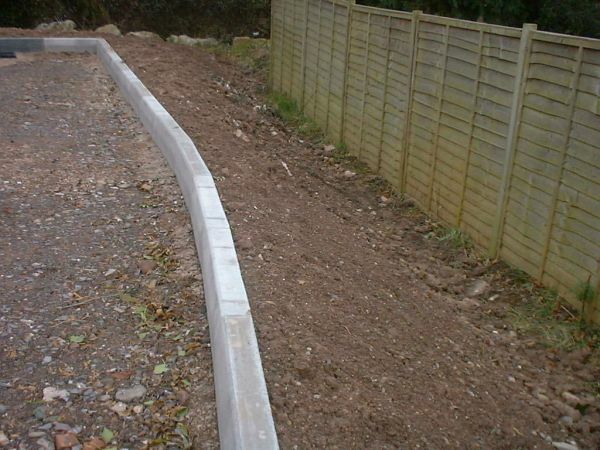 It was installed simply to divide the garden when Mr Hooper tried to obtain planning permission to build several houses on land that now forms his new car park. 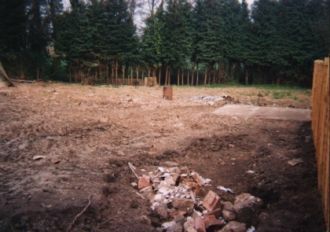 In this second photo, the area of concrete is part of an old garage base that used to be in the garden of Village End. Much of the original garden of Village End was at an even lower level. These two photos may be viewed at a larger scale on the original webpage. Looking west along the new kerb stones, the fence panels are clearly well below the level of the new car park. Originally, these panels simply divided an area of flat level garden that was very low-lying. The large new car park has been formed on land that used to be well below the level of the original car park - where cars are currently parked. Now, the two areas are level with each other. Some of the building works to Hamilton Garage can be seen still in progress. Again looking west along the new kerb stones, and showing the height to which the new car park is raised above the level of the adjoining garden. Originally, the garden had a low point and a pond in this area. A public sewer may also run under the new car park. The entire area of raised land appears to be drained into one corner - and then straight into the river via this 150 mm pipe! This will add to the risk of local flooding because the water is discharged upstream of the Sidford bridge. If the land in question had been downstream of the bridge, there would be far less risk. Amongst the several possibilities here are that the site owner was badly advised, or his planning advisors knew exactly how much they could 'bend the rules' and get away with it in the East Devon area.